Ireland is a kid-friendly country to visit with the family! From scenic vistas to historic castles, there is something to inspire children of all ages. However, kids can only handle so much sightseeing and so we filled our trip with plenty of time at playgrounds. 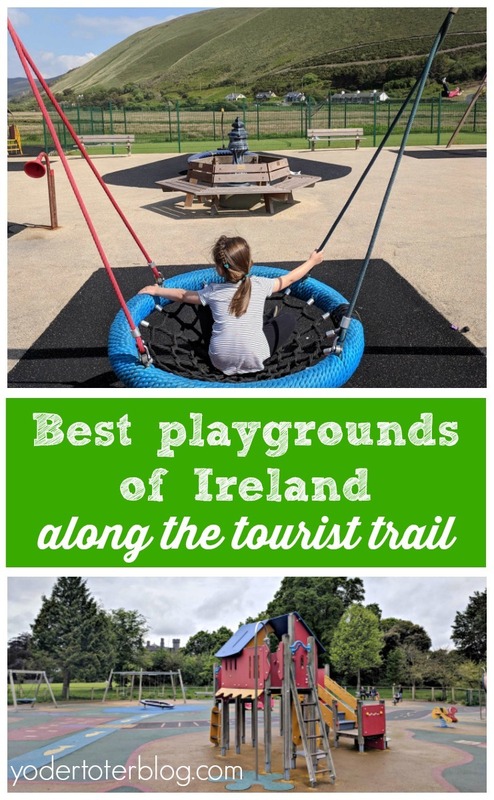 Here are suggestions of which playgrounds of Ireland you’ll won’t want to miss! Kilkenny Castle Park is exactly where you would expect- Kilkenny! Thanks to Jody from Ireland Family Vacations for recommending that we stop at this playground because our children loved it! We had just arrived in Dublin that morning and needed some fresh air to keep us awake after a very short sleep on the plane. Our final destination was County Tipperary so Kilkenny Castle playground was a logical choice. The playground has rubberized flooring which is great for young children. The area is fenced and has plenty of space for big kids, too. For adults, the playground offers a distant view of the castle. A nearby walkway allows visitors to access the canal and take a scenic walk into the city of Kilkenny. Kinsale’s location on the water makes this water-themed playground even more magical for the children. Kids will enjoy the merry-go-round, an oversized slide, and a make-believe boat at the Kinsale playground. Adults will enjoy a beautiful view of the harbor and proximity to downtown. Kinsale Playground is located on Pier Rd. in Kinsale. Dingle is a popular destination for starting the Slea Head Drive on the Dingle Peninsula. 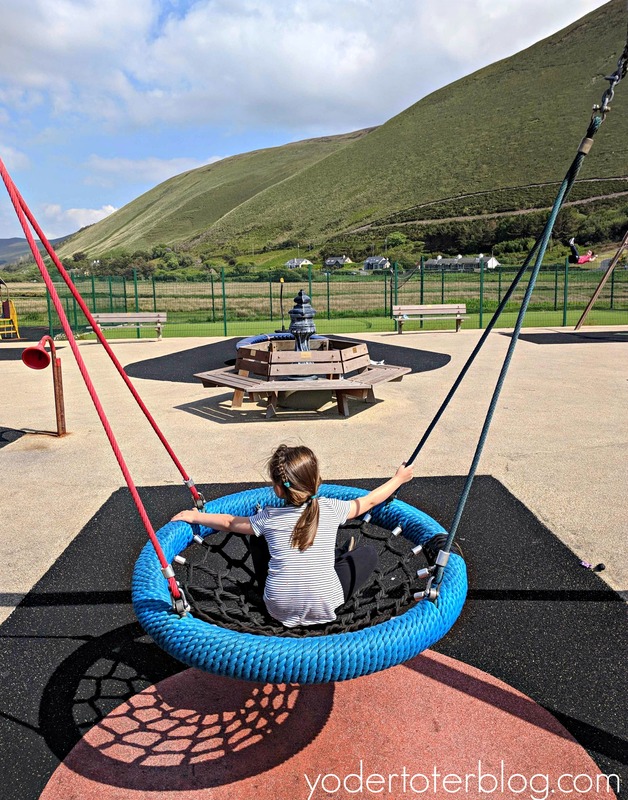 The playground is right off N86- you should see it right away as you come into Dingle- especially if you’re following the Rick Steves tour of the Peninsula. Not going to lie, we promised our kids a trip to the playground in Dingle if they gave us a drama-free day of sightseeing. 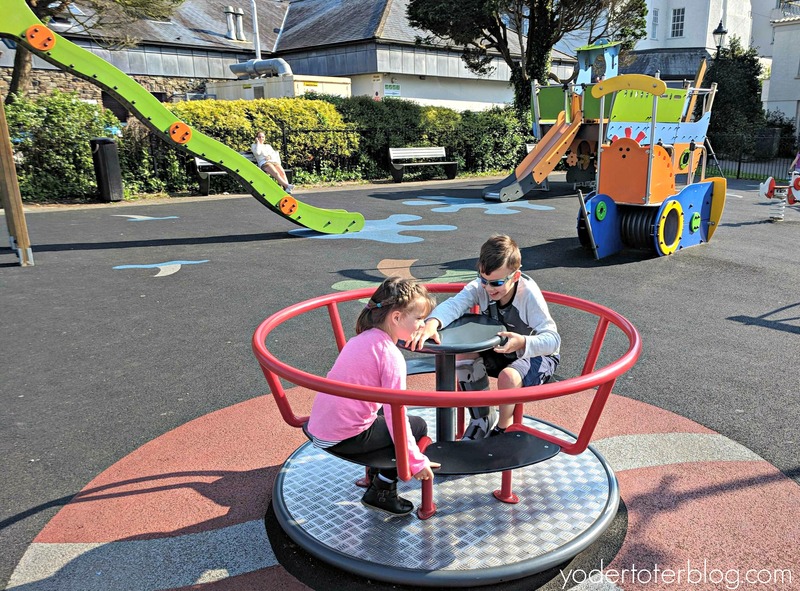 The Dingle Playground provided our children with over an hour of fun after being cooped up in the car all day! This playground equipment was new in 2017 and includes a nautical, travel theme with a rubberized surface. While Kinsale playground seemed to be full of tourists, we made friends with locals at the Dingle Playground. I loved hearing the exchange between a young Irish girl and our son. She told him, “Your brother doesn’t look like you!” (He doesn’t! ), and then Jackson responded later with, “I’ve never met an Irish girl.” The girl’s mum and I laughed and laughed. Dingle playground is so kid-friendly! If you’re driving from Dingle Peninsula or Ring of Kerry back to Dublin, Roscrea makes for a delightful stop along the way. Roscrea is a medieval town with a 13th-century castle. Glebe Park and Playground is located just a block from the town square and a couple of blocks from the castle. The playground and its adjoining green space are surrounded by a rock wall. Our children’s favorite feature was the zipline! Moms – just look away! 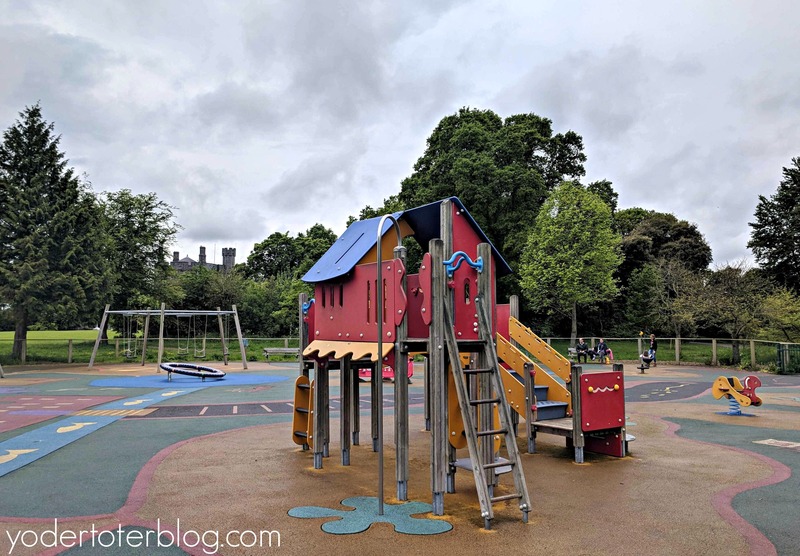 Glebe Park & Playground is located at 1-7 Ballyhall, Roscrea, County Tipperary. 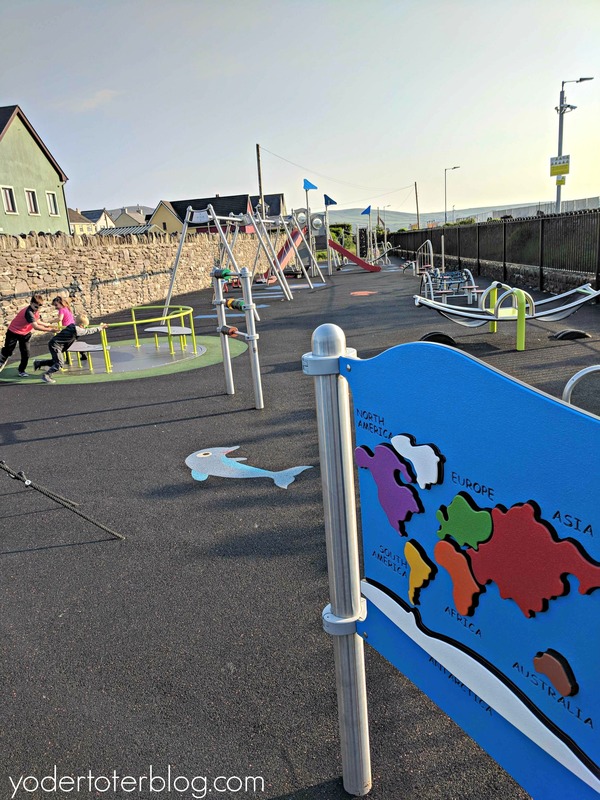 The Rossbeigh Children’s Playground is a quick jaunt off the Ring of Kerry. Rossbeigh is a perfect stop for those doing the Ring of Kerry in the recommended clockwise direction because your stop in Rossbeigh will be at the end of your day. 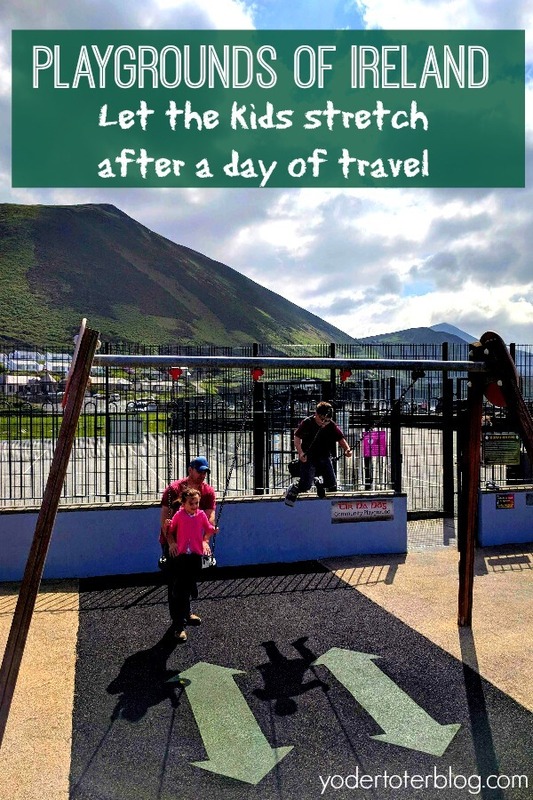 Rossbeigh Children’s Playground was probably one of our favorite playgrounds of Ireland because of the views! Every direction was something exquisite- from the North Atlantic Ocean to the lush, green hillsides. If you’re traveling Ireland with a toddler, there is an enclosed area just for the little ones. We found Ireland to be an easy place to travel with kids. The number of quality playgrounds added so much value to our trip. I’d recommend traveling to Ireland with kids and making sure you leave time to play, enjoy the scenery, and chat with local parents. Do you stop at playgrounds while traveling with kids?